Bruicladdich released this PC11 along with Octomore 6,2 (watch this space for tasting notes coming soon!) a few months back to the travel retail market. This is the first time Port Charlotte or Octomore are sold there AFAIK, but there is a catch : They did not release it to the UK travel retail market ,perhaps because of the very high margins those TR shops (see my previous guest post that explains more here) . At any rate, when i learned that the Tel Aviv duty free stocks this whisky, and for a fairly good price ($145) It was only logical to get get a bottle. As it happened, I was traveling to Rome and although I usually do not visit the Israeli duty free since prices are very high (higher than non duty free shops in the EU), this specific whisky was cheaper here than the RRP, go figure. Not that I am complaining or anything. I’ve been asked by many people who seen pics of the bottle on my FB feed, where you can get this one, and the truth is I really do not know besides Israel (by now it’s all gone). At any rate, this is a superb whisky, and my notes are below. Nose: Pepper peat kerosene and sweet notes with the unmistakable sweet lactic notes that one associates laddie with. Hot cinnamon gum. Soot. Sea spray and d peat reek. Can you ask for more? Palate: Massive on the palate with chilly heat and spicy cinnamon. Then lots of peat , and medicinal notes too on the third wave of sensations. lots of smoke and ash with a sweet sugary back tone. Finish: Cinnamon gum. Ash. Bandages. Burnt sugar. Bitter oak. As you can imagine from the notes, I love this whisky. It’s fantastic. It does feel peaty, but does not lack in complexity. 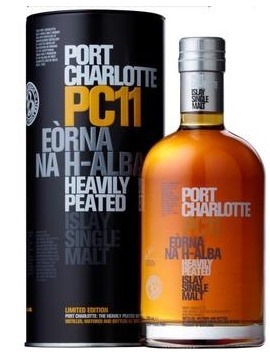 You’re probably wondering how does it compare with previous editions of Port Charlotte (mainly PC10 which was more widely available, and which I reviewed just recently). Well, I do think this one is a tad better, but still very comparable, I did not try them head to head, so it’s not easy to really compare. What i can say is that : Should you fly and see this bottle at a DF shop anywhere, Grab one fast. You won’t regret it, I know there are tons of people longing to get their hands on one,and just can’t. So, can’t go wrong there eh? Super job on behalf of Bruichladdich. Hope they fix their mash tun very fast, and be back in business soon (In case you’ve not heard, their old Mash tun is out of order for the last 4 months or so, and they are now in the process of fixing it which will enable them to distil again). So, lots of luck with that guys, keep on making beautiful drams like this one. We love it! Do you have any idea where that PC11 is available? I’d like to get my hands on one. finally got that disqus to work… i am trying to get that info from laddie now. if i have more info I will update mate.